The serial and model number will help you find comparable sewing machines on the internet to help determine the worth of yours. 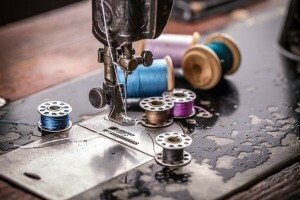 This is a guide about value of vintage singer sewing machine. How much would my 1953 Singer sewing machine in mint condition be worth? To get the best estimate, can you add the Serial/Model number? Also does it have any extras, like the book or accessories or the case? Most importantly...does it work? Ebay and other sales venues are all about the comparables...and you have to do an apples to apples comparison! If you have one on the higher end of the spectrum and are keeping it...talk to your home or renters insurance broker to make sure it would be covered under your policy in the event of loss or damage!! I have a Singer sewing machine, model #192 with original proof of purchase and owner's manual; what is it's value? Antique and vintage Singers generally have little value, I'm sorry to say. However, some in 'mint condition' can auction for a fair sum (rarely into the triple digit figures - but that's rare!). The big money Singer collectibles are the Featherweight machines but your 192 is not a Featherweight, it's a 'Spartan', so named for being the simplest yet hardest working of the Singer domestic machines - the Spartan straight out of the factory (usually the one near Glasgow, Scotland) was capable of handling not only everyday fabrics for clothing but several thicknesses of denim, hessian and jute (burlap), even leather and so the machine had a lot of value to farmers and isolated rural homes. But it was a very inexpensive, stripped down model that didn't come with a lot of accessories. If the decals are in excellent condition, if the machine is still in working order, if the factory paint is still on and in excellent condition, if the original receipt, owner-user guide (original! ), and original accessories are with the machine, if...value depends on all of that and most importantly - if someone is interested. If you're hoping to sell this machine, do your homework - check on the Singer website for the build date and gather as much of the machine history as you can (for example, was it a wedding gift to a young farm bride and did she use it to sew for the farm or a family soldier marching off to WWI and WWII? Did she sew everyone's clothing on it and do you have any of those garments or a quilt made from the worn out clothes?) - then write that down on a separate sheet of paper - this is called provenance and it adds to the value of the machine; check on eBay and CraigsList to see if yours or any model antique and vintage Singer are 'hot' and selling, and for how much. Also do some search engine runs using the machine maker/model name-number+collector to see what comes up. At this moment, the most you could hope for is low double digits (I mean low, like close to teens rather than fifty) but it's possible to make the machine more desirable IF you can prove provenance. I have my mother's Singer Featherweight 221. She was not a sewer so it was only used for mending. It sews and has been stored in it's black carrying case and has a little box of attachments and the booklet. It is shiny black with gold scroll around the base that you sew on. According to the serial # and the copyright in the booklet it is from the 1955-1957 period. Only use exact matches and don't use what people ask in current auctions...value is only in what someone has actually paid. These are neat old machines!! The last time I looked they go for around $400.00.